Yesterday I completed the journey over the border, making it from north San Diego to Ensenada by day’s end. It was the longest and toughest day so far. I clocked in at around 160 km (100 miles) but it felt much longer, struggling as I was probably 30-40km before Ensenada. The day before leaving I was feeling quite down about leaving San Diego. I’d got pretty comfortable there, enjoying the rest and being able to relax. I considered staying longer, but figured that perhaps I’d still feel the same when it came to leave. So, decision confirmed, I planned an early start to give me as much time as possible for the day ahead. I was up later than hoped but managed to get away by 8am. My intended short stop at Café Virtuoso (a local Fair Trade coffee roaster) turned into a much longer but great experience (see previous post). But after the tasting and lingering talking to Stephan and Rigo for a while, I had to get back on the road. I still had several miles to the border. Passing through San Ysidro, the final US town, I got a sense of what was to come with two main smells beginning to dominate. Money (cambio booths everywhere) and fast food. But I pressed on and had a surprisingly uneventful crossing. The border turnstiles almost contrive to put a block on cyclists passing through but were just wide enough for loaded-up Edna. I found the immigration office, got my tourist visa, suncreamed up and was on my way again. 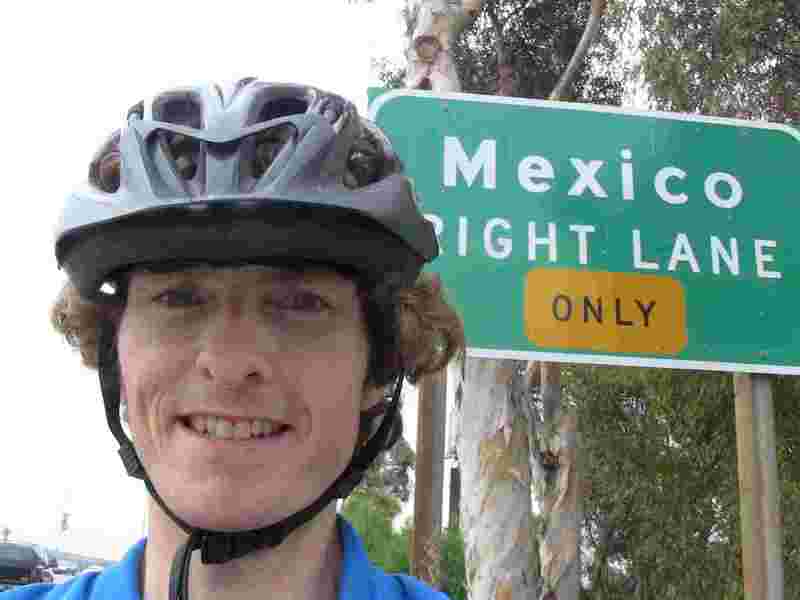 Now for the fun part – which way is it to Ensenada? To make things interesting for newbies, there are two routes – the free and the toll . And I thought I’d found the right way, following the signs, only to roll up to the start of the toll road 8km out of town and be told to turn back around. Not good; I was already behind schedule. On the way back to Tijuana I missed the sign (that didn’t exist) but back in the city centre I managed to get on the right path after asking a passing cyclist the way. It meant another detour through Tijuana, which was a messy riot of fumes and food and music. Complete contrast to anything I’d experienced in the US. The ride out of Tijuana was long and arduous and became mentally exhausting. Lots of traffic, no bike lanes, distractions everywhere. It made cycling through LA seem like a picnic. Rolling through the subsequent towns was so different to anything before. Rosarito and beyond are just long strips of getup for tourists. Roadside shacks selling all kinds of food; litter; hotels & restaurants; people all about; cars (and some trucks) driving pretty much as they wish to. Many places in Baja have been going through a push for attracting more tourists but this stretch looks like it has bitten off too much, with many developments looking half-finished and untouched in a while. I was in a bit of a rush to get to Ensenada before dark, and then had a push inland that led me through some hills that felt a lot bigger than they probably were. By then I’d been on the road for 5-6 hours and still had another two or three to go. I felt ready to stop even then. The remote countryside meant just pushing on as I passed through good and bad phases; I was determined to make it before dark. 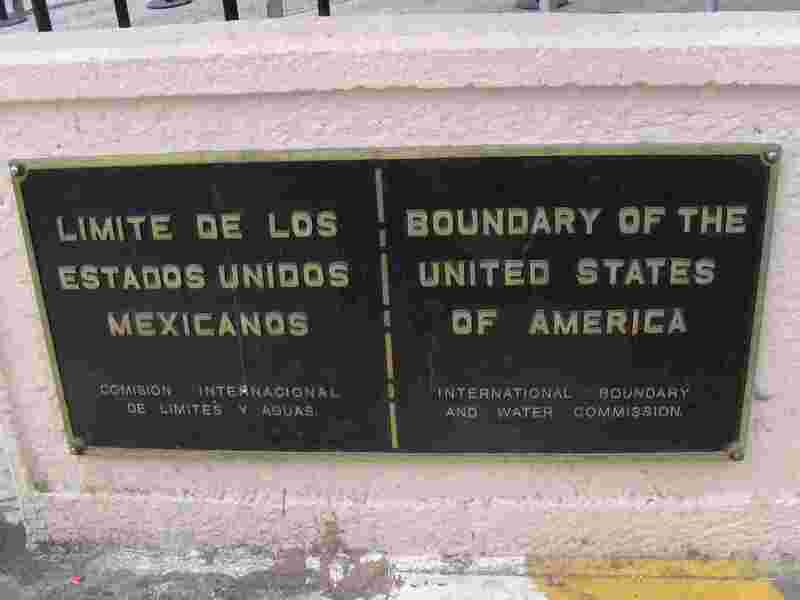 One thing I was very happy about earlier in the day was soon after crossing the border when my concerns about leaving San Diego and the US were replaced by excitement of having reached Mexico. I felt good about being here and the new experiences that will bring. With some relief I pulled in to the main tourist area of Ensenada and went to my intended stopover, only to be told it was full…luckily (or perhaps by strategy) the guy’s brother-in-law had another motel a couple of blocks away. An extravagant night for a double room (no singles) but I didn’t care by then. To have arrived safely and in good time was all I was thinking of. Oh, and dinner..
Leaving San Diego I planned a short stop at Café Virtuoso, a local Fair Trade coffee roaster. I was a little late getting on the road but my delayed departure led to a surprising bonus. Every Friday morning they host a small tasting session that anyone can join in on, where they check on the quality of a couple of batches of coffee. Result! I love coffee and this was a great way to end the US part of my trip. Spoon in one hand, spitting cup in the other, I went to work to decipher the complexities of four different coffees. And of course the slurping. I managed to do this a little too well on my first slurp and nearly got into a fit of coughing. Apparently it meant my airwaves had got a full dose and that’s a good thing. During the session I talked to Stephan, one of the company partners and he told me how they check the aroma of the coffee beforehand (among other things) while the tasting itself looks at flavour, acidity, body and aftertaste. I left it to the pros to figure out the exact differences between the coffees but was able to pick out differences between the coffees they had. Something to look into in future I think. After the tasting I lingered and talked to Rigo from the company for a while, who told me more about the company philosophy and how they also help women from one co-operative through their work helping to making the coffee sacks. It was a great inspiration to be involved in the tasting and get a better idea of the company and its involvement in Fair Trade. When I meet people involved in the movement it always makes me remember why I’m doing this trip and how Fair Trade can really help those producers. Reluctantly I headed south out of San Diego yesterday. A few days rest there had got me into a comfortable state, enjoying the neighbourhood, having time to relax and just enjoy the area. I’m not a big beach person but being near the water and staying in a nice place meant for lots of pleasant wandering around. Not to mention the Co-op down the road (did I mention that before?!). But it was time to move on to new experiences..
There’s sun, but is that really a tan or just dirt? I’ve been on the road for over 6 weeks now and until reaching San Diego was camping each night. Warm, comfortable showers and sleeping arrangements were obviously somewhat limited, and being on the road means suncream, dirt and (occasionally!) a bit of sweat. As you’ll have seen, I’m fair-skinned, and usually go from white to red at the drop of a sunhat. Part of my body are getting some colour now, but is it just grime or could it signs of a real tan?? 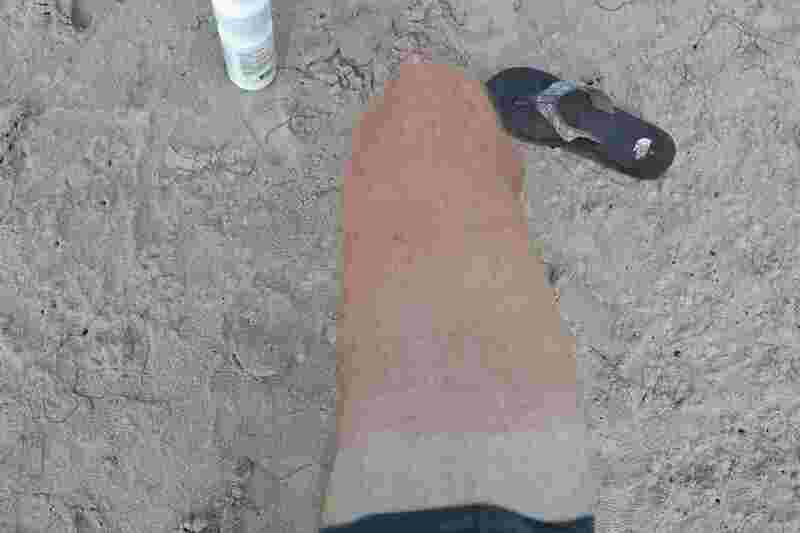 Author kieranPosted on July 28, 2011 August 6, 2011 Categories Bike TouringTags bike touring, camping2 Comments on There’s sun, but is that really a tan or just dirt? In my San Diego stay, which is at the Point Loma Hostel near Ocean Beach, I’ve hit the jackpot and am close to the People’s Organic Co-op, a store that puts me in vegan and Fair Trade heaven. Multiple visits per day have been known..
Too bad then that they were closed today for a staff shindig (how dare they, while I’m in town!) and so I had to look elsewhere for my Fair Trade coffee this morning. Ocean Beach has a lot of little coffee places so I thought I’ll find something. At least one certified organic – it’s that kind of neighbourhood… but believe it or not I found nada and the ‘organic’ coffees I did see were few and seemingly labelled as such because the owner thought it might be a handy idea. If you’re looking for hazlenut, vanilla, dunkin donut, almond, mint mocha, even ‘jazzy chestnut’ flavour of coffee then head to Ocean Beach right away (a lot of places open at 5.30am). I couldn’t even bring myself to ask Starbucks (Starbucks in Ocean Beach!?) to brew their Fair Trade Estima blend for me today. So I’ve skipped for now and hopefully can find something elsewhere after lunch..
For a lot of the trip so far I’ve had the luxury of a number of bike lanes. Some good, some pretty worthless. 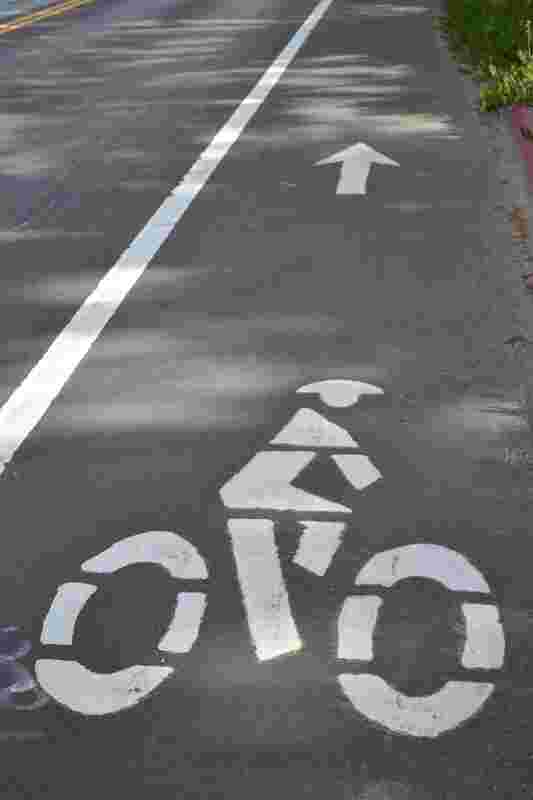 But one thing I’ve noticed is how the bike lane markers are a little different in America. 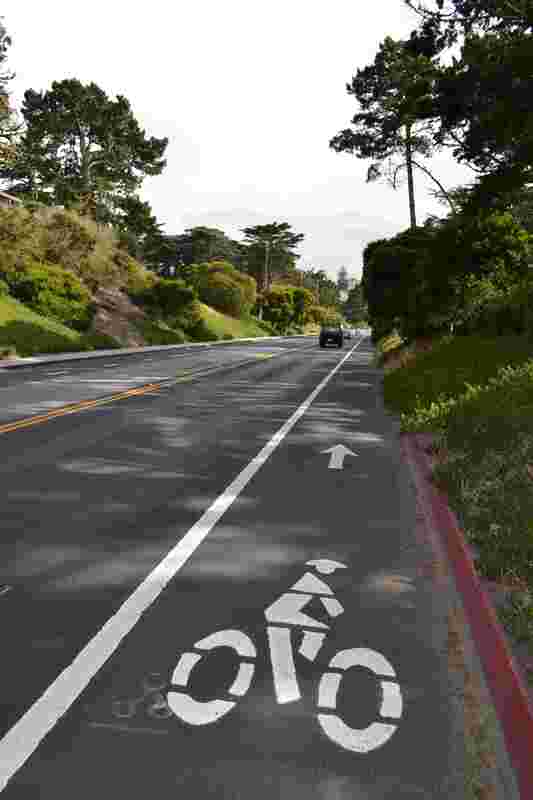 The latest in bike lane design...but what's the reason behind it? As a further note – there are differences in the width of the ‘cut’, so in some cases the ‘ladies’ are sporting a very wide, almost pigtail-like ‘do but for others it’s a closer cropped look. More streamlined perhaps. Author kieranPosted on July 27, 2011 September 20, 2011 Categories Bike TouringTags bike touring1 Comment on Fashion, feminism or safety…?